Wade peered over the edge of the chicken coop looking for signs of the raid. A handful of hens clucked about and a rooster strutted around them, indifferent to the scrutiny. There were no signs of a disturbance other than missing chickens and a patchwork of wolf tracks emerging from the trees at the edge of the farm. The size of the tracks suggested a violent end for the livestock but the condition of the coop suggested something more precise. Wade’s friend Donaar ignored the chickens but paced anxiously around the coop inspecting the tracks. He crouched down and placed his hand inside one of the impressions and then looked up. “Looks like we may have more blood on our hands than we bargained for,” he said. “Maybe I should have brought a bigger hammer.” He stood up and ran his fingers over the head of the war hammer hanging from his hip, then followed the tracks to the edge of the trees. He stared into the woods, inviting the wolf to come out and settle the score. “Maybe a bigger hammer is in order,” quipped Wade, “and maybe we should go back to the enclave and get a few more. I think we should raise some company.” He grabbed his crossbow with his right hand and crouched down, pointing at the tracks with his left. “I’ve laid down my share of deer with this bow and I’ve brought home a few wolf pelts, but this is entirely different”, he said. He slid his entire index finger into the paw impression, measuring the depth of the print. “This animal weighs three men or more – the size of a bear. And it’s tall enough to reach into this coop and make off with dinner without touching the sides” he said, pointing at the small fence. That makes him four feet at the shoulder.” Wade stood up and looked directly at Donaar, who was still looking into the trees. “That’s a big animal” he said. “I think we need some help”. Donaar turned and looked back at his friend. Wade was smart, to be sure, but rarely took the initiative in the face of uncertainty. He was always calculating, always reserved. Donaar was the opposite, never doubting, always taking matters on faith and relying on his intuition. Wade’s reaction was predictable but not an option for the dragonborn. “I’m almost three men or more” he said, pointing at his own chest. “And I’m not splitting the reward with anybody but you. Just stay behind me if you’re worried. These tracks are fresh and so is this blood” he said, unsheathing his hammer. “I’ll smite the wolf. Let’s get on with it”. Donaar disappeared into the trees and left Wade standing alone, knowing very well that any response from him would be ignored. Donaar had made the decision for them and wouldn’t change his mind rationalizing about the danger. “Very well”, Wade resigned quietly, “let’s get on with it.” He took a deep breath, cocked his crossbow, and followed his friend into the woods. Better to take on the animal together, he reasoned, than separate and take him on alone. The fertile ground of the farm yielded to a forest floor thick with debris. The smell of the chicken coop faded, replaced by the welcome scent of the fey wood. The tracks gave way to a foot path, a winding, narrow route clearly used by animals and humanoids alike. The dirt of the path was compressed and covered with the debris raining down from the canopy above, but the sides of the path were spotted with deer, fox and boot prints. The pair followed the path cautiously at first, looking for signs of their prey. But as the morning wore thin their concentration faded and they started to stroll, reminiscing about their days growing up in the enclave. Groovy artwork resembling Wade & Donar’s home. They were unlikely friends. Donaar’s family was from a long line of wandering dragonborn, a serpentine race scattered across the world in search of their homeland. His extended family settled into the enclave when Donaar was young, and his immediate family was one of the few left behind when the perpetual migration called the others away. The eladren that lived in the heights of the enclave welcomed the remaining families as their distant brothers, linked by correspondences in draconian legends and ancient eladren scrolls. Donaar’s family and their kin settled into burrows at the base of the enclave trees, carved out and long since abandoned by a neighborly clan of dwarves. 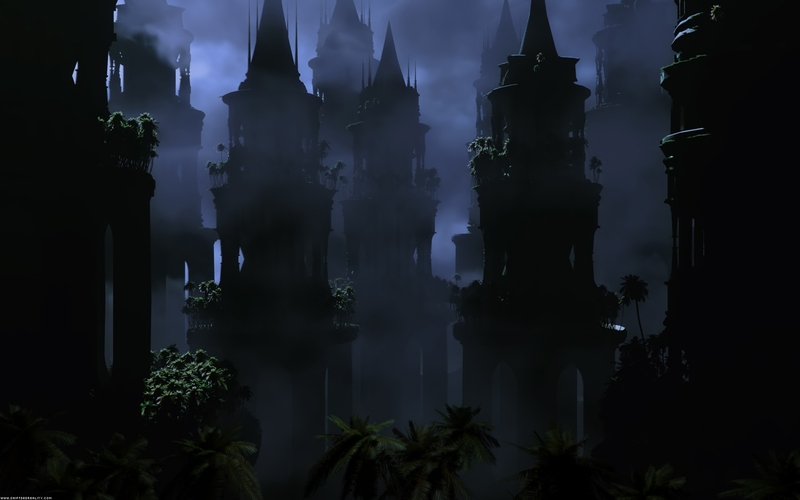 They tended the grounds and the perimeter gardens while the eladren managed the rich complex of lofts high in the trees, sniping game from above and foul from below. The dragonborn’s steadfast, principled nature served as a fine compliment to the slippery complexities of eladren philosophy, so much so that they raised a temple nearby hoping to offset their influence. Donaar spent much of his childhood there, playing in the statue garden and swimming in the river, and with the help of the temple clerics he committed much history to memory. He became an acolyte and regarded the priesthood has his certain destiny. But as his understanding of dragonborn history expanded the nature of their plight overcame him. He lost interest in the intellectual pursuits of the church and he started to imagine a future ending the great migration and uniting his people in the vast, undiscovered city foretold by prophecy. By the age of emancipation he could think of little else. Wade’s family was somewhat less principled than their neighbors. The Slybones were known around the enclave and in nearby towns as unscrupulous accountants and mystical numerologists, making their living by pinching from contracts and otherwise acting as dubious middlemen. There was some hearsay, spread without proof beyond the suggestion of their name, that some of their clients had been swindled or blatantly misled. But proof was hard to find because the contracts they managed were always written to mesh tightly with provincial law and protect the family from related disputes. They frequently wrote contracts so long they required multiple scrolls to enumerate all the provisions, and some of them were so long they were bound as books. A rare client had the intellect to understand the complexities of those contracts, and the rest were inevitably left turning over a small portion of their income to the Slybones clan. Wade’s family managed quite nicely at the expense of the rest of the locals, as did the traders and farmers that were party to the contracts. It was a delicate balance that required skillful management and diplomatic finesse. Wade had the character, charisma and the intellect to continue the family business, and when he was young he had some interest in doing so. But as he grew older and started to learn the finer points, his interest waned. He began to spend hours reading through a small trove of eladrin scrolls and books discovered in his attic, most of them previously unread, simply acquired as investments by his father. Beyond numerology and simple mysticism, the eldritch ways of the ancients began to consume his waking hours, and he began to amass his own reading materials about the magical arts. He converted the attic to his own personal library, building shelves directly into the round walls of the tree and expanding the ceiling so high that he required a system of ladders to reach all of the books and scrolls. He became increasingly isolated as his studies consumed all of his time, and his fair complexion eventually faded to white after spending countless hours in his library. A rare day brought fresh air and a visit from his childhood friend Donaar, and that was exactly how Wade liked it. Donaar was the first to spot the clutch of feathers on the side of the trail in front of them. They were clearly remains from the missing livestock and a certain indicator that they were closing in on their prey. As he approached the remains he saw the unmistakable impressions of a massive predator, a maze of paw prints surrounding the carnage and then merging back onto the trail. In the dim light of the forest canopy surrounded by evidence of violence the tracks somehow looked bigger than before. “That’s not a wolf” said Wade, nodding toward the feathers. “That’s something else. A wolf does not carry its prey two hours into the forest to eat it by the side of the trail. That’s a deliberate action, not the work of an animal”. Donaar was a few steps ahead, inspecting the remains closely. “You’re right”, he said, standing up . He pointed towards the feathers. “That chicken was butchered. Looks like we might have our hands full”. He looked around cautiously and started flipping his hammer, tossing it a few inches in the air and catching it by the handle as if he was getting ready to throw it. Wade turned from the trail and walked a dozen steps into the forest. He glanced around, then started walking diagonally towards the trail. He zigzagged like this following the path for a few hundred paces before something caught his eye. In a patch of soft soil he found another track, smaller than his hand and shallow but for the ends of the toes which curled sharply into the soil. Three digits on the front and one on the back made the impression look like that of a large bird or lizard. He called to Donaar, whose dragonborn heritage had exposed him to all things serpentine. “What do you make of these?” he said.